In the entrance plaza of the John F. Kennedy Center for the Performing Arts stand two large bronze panels by German artist Jürgen Weber (1928-2007): "Amerika" and "War or Peace." The two pieces were created between 1966 and 1971 and were a gift from the Federal Republic of Germany in memory of John F. Kennedy. Weber was born in Münster (North Rhine-Westphalia) and studied art history and sculpture at the Staatliche Akademie der Bildenden Künste Stuttgart. He is well-known in Germany for his bold - and often controversial - sculptures, which stand in prominent public spaces all over the country. 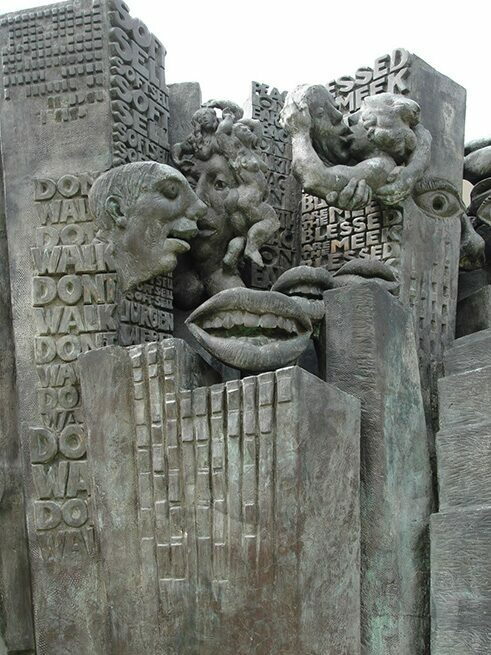 In addition to his monumental sculptures, many of them on religious themes, he was also known by generations of students who studied with him between 1961 and 1996 in the architecture department of the Technische Universität Braunschweig, one of the German Institutes of Technology.Weber's panels for the Kennedy Center - like his sculptures elsewhere in the world - are expressions of his strong personal thought and philosophy. The figures in the panels are endowed with robust physicality. In the panel entitled "Amerika," which stands outside the "Hall of States," Weber makes reference to United States history - begínning with the enlightenment ideals that gave birth to the new nation. He portrays American dynamism, the country's industrial strength, and the mixture of peoples and cultures. The complementary panel, called "Krieg oder Frieden," "War or Peace," stands near the entrance to the Kennedy Center's "Hall of Nations." Here, Weber evokes the horrors of war and the blessings of peace. On the side depicting peace, the artist includes a large group of fleshy musicians with the words "Jürgen Weber and His Band" at the lower edge of the panel. The panels are dated 24 December 1968, 21 July 1969. The artist's emotional and intellectual statements well deserve their prominent setting at the United States' national memorial to JFK.